keeping it soft and letting some blush do all the way. for the light'n breezy look-out into the weekend today's cravings include: myla rose silk satin teddy. current/elliott natural denim boyfriend jeans. cutler and gross mirrored aviator sunglasses. emilio pucci leather mesh peep-toe booties. 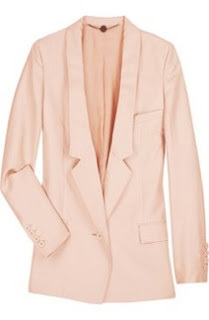 stella mccartney blush oversize silk jacket. WOOW! I realy love the swimsuite and the trousers! they are to die for!